Vet services here in the UAE are rocketing sky high. The cheapest that we could find here in Abu Dhabi were the National Veterinary Hospital and the Falcon Hospital. The National Veterinary Hospital, although cheaper than other vets, is still a little bit on the pocket. Falcon Hospital on the other hand offers cheaper services; however, it is in the middle of nowhere and requires at least a 45-minute drive from the city to its location near Swehan. So I googled and googled for "cheap" dog services here in Abu Dhabi and found this website of the Abu Dhabi Police. Little did I know that the Abu Dhabi Police's K9 Unit offers services for dogs such as training, treatment, surgery and even sheltering and their prices are way more affordable than what other vets offer. Aside from that, they also issue pet passports. What is a pet passport? It is a document that states all the necessary information for your dogs like the microchip number the vaccines that he/she had and treatment/surgery if applicable. The pet passport can simplify the transport of pets between one country to another thus avoiding pet quarantine, which can sometimes take up to six months. This is required and a must in some countries such as the UK and countries in the EU. This should not be confused with the health certificate that the vets issue. These are two different things. 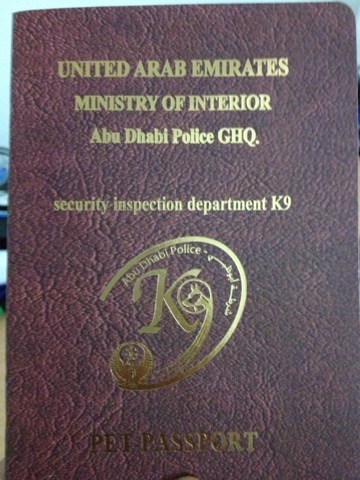 How can one obtain a pet passport in Abu Dhabi? Pay the necessary fees (AED 15 for membership and AED 140 for vaccination). Voila - you now have your pet passport.